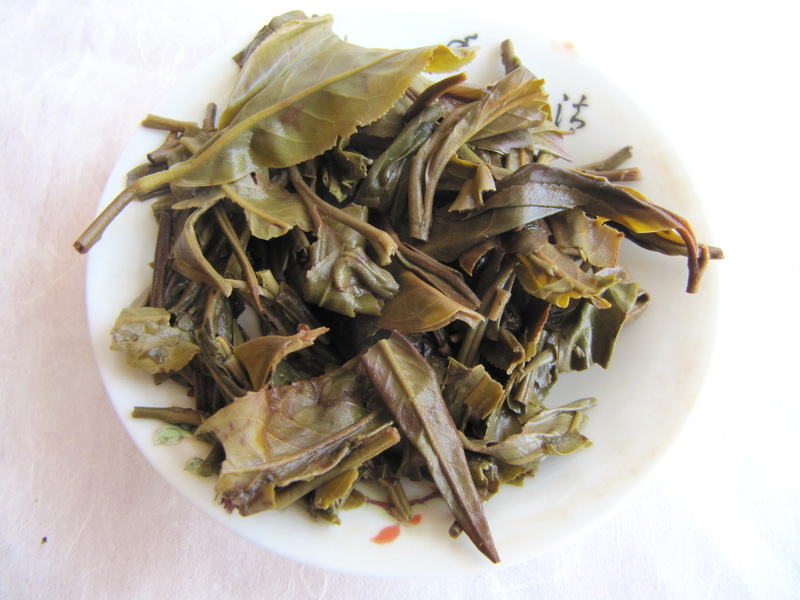 This is a Spring 2012 tea from Cha Lao Guai. The tea comes from old trees near the village of Man Zhuan. The first thing that strikes you with this tea is how full and thick the flavour is. The bei xiang is a heavy with floral notes, but otherwise the fragrance is quite reserved. The ‘yedi‘ are not particularly pretty, but they are good, honest leaves, and there are plenty of whole ones. A little reddening here and there that could be an indication of shaqing that was a shade on the green side – which quite likely was intentional – and maybe also a little leaf damage. The rukuo has quite a bold quality, bringing with it some astringence and a little kuwei which transforms into a decent huigan. This tea also has good shengjin. The huigan lasts well and is accompanied by floral notes that float up into the nasal cavity for some time after the tea has all gone. People talk about what Man Zhuan tea was like up until a handful of years ago, lamenting a loss of heftiness in the flavour, but it seems to me, this tea is somehow approaching that kind of experience. This tea has sold out. There is a 2013 tea from the same village.